Banjul, Friday, 7 June 2013 -- The African Development Bank (AfDB) has announced the 10 winners of its first continent-wide eHealth competition for 2013. This award, according to information issued on AfDB website, recognizes the current work being done in e-health and m-health in Africa and aims at encouraging the production and sharing of knowledge on eHealth solutions. An award ceremony will be organized in September 2013 in Tunisia to recognize the contribution of winning projects to development in Africa. Certificates will be awarded and several opportunities, according to AfDB, will be given to innovators to share their experiences. This is indeed a big achievement for the WHO African Region, and in particular for the Health Promotion Cluster, demonstrating health promotion as workable and viable tool for bringing about positive health processes and outcomes. The competition was based on four parameters: Access to health information; empowering the health workforce; health education for the public and delivering health services. It employed a rigorous selection process based on the following criteria: a clear description and analysis of the most important health challenge addressed by the project; a description of proposed eHealth solution and how it alleviates the challenge or mitigates its effects; a description of innovative aspects of the proposed solution,; useful lessons learned and recommendations; implementation arrangements; budgetary estimates; key strengths of the institution and partners leveraged to achieve project goal and objectives; estimated impact of roll-out of proposed solution throughout the country; quality of information and data provided; and letters of recommendation. 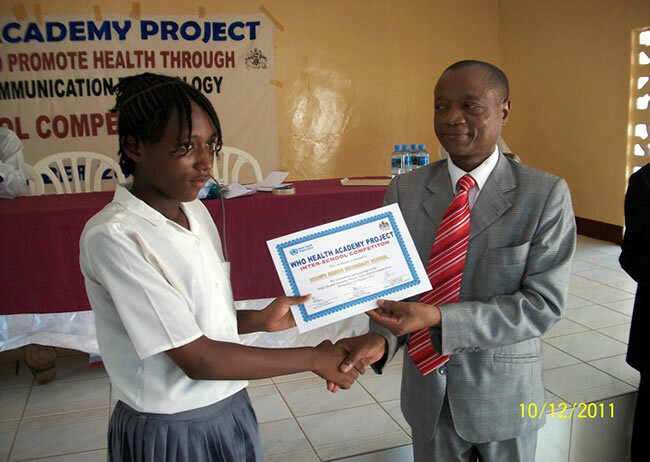 The WHO Health Academy Project, jointly implemented by the WHO Country Office and the Ministries of Health and Social Welfare and Basic and Secondary Education, was rated among the best ten of the 116 entries received by the Bank, and also the single winner under the Health Education for the Public category. The Health Academy Project is a WHO-Initiative designed to create global health and technology network to promote health of young people particularly the school going age. It provides health information and improves knowledge about attaining and maintaining good health. Through eLearning – learning by any electronic technology and media – the World Health Organization has developed the means to reach out to people with information on disease prevention and health promotion. The Academy's eLearning package of health courses provide more than just distance education. The graphics, animation and interactive features have been designed to engage people so that they can enjoy the learning experience. The package introduces basic principles of health awareness and encourages students to build on their knowledge, which in turn helps them develop critical thinking. Hence, the Health Academy Project is an ICT-driven initiative intended to teach, entertain and build skills of students in tackling common health problems such as malaria, diet, physical activity, mental well-being to name but a few. Health Academy courses have been used in six countries in three WHO regions and are expanding to promote healthy behaviours, and transform the learning experience about health. The Project was initially launched by World Health Organization in 2003 and set up a pilot implementation programme in Egypt and Jordan. In 2007-2008, it was later introduced in four countries namely, Lebanon, Ghana and Gambia and in Philippines. It will be recalled that the WHO Country Office in collaboration with the Health and Education Ministries, and with support from WHO-AFRO and WHO Headquarters, successfully piloted the WHO Health Academy Project in 10 Senior Secondary Schools in 2009. WHO-HQ and WHO-AFRO provided the requisite financial and technical support, respectively; whilst the WCO served as the technical guide, facilitating the designing and implementation of programme in collaboration with the participating Ministries. Several courses on malaria, physical activity, HIV/AIDS and safer food for better health, packaged in CD-ROMS were run in the participating schools. School teachers were trained to run the courses and computers were donated to strengthen existing laboratories in the participating schools. 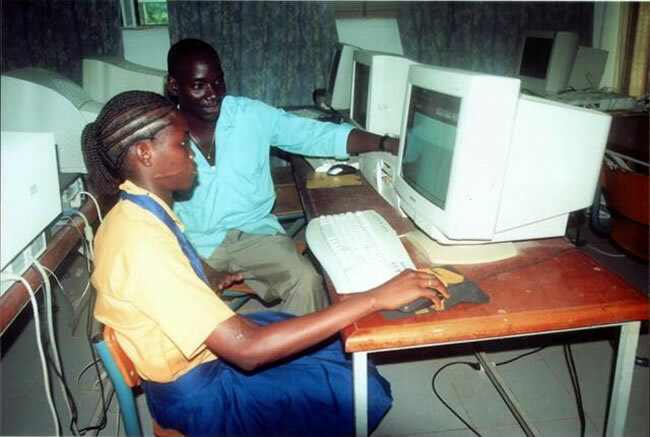 Based on the successful outcome of the pilot, the project was later extended to more senior secondary schools between May and December 2011. This expansion phase covered fourteen (14) Senior Secondary Schools (May – July) and fifteen (15) more schools (October – December) respectively. In all, some 39 schools, with an estimated population of over 35,000 students, have benefitted from the project during the pilot and expansion phases. 5. 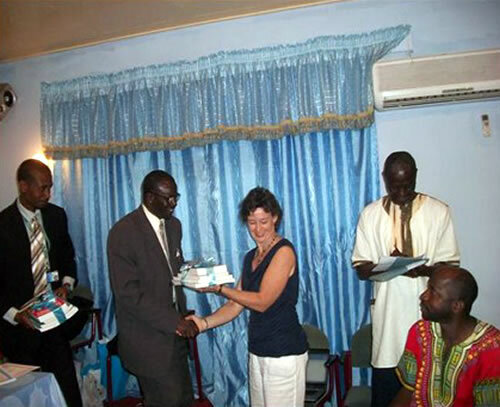 To strengthen partnership for health promotion in Gambian schools. The project has demonstrated significant improvement in knowledge and behaviour change among students across the three modules. There has been a 9% increase (form 23% to 32% for pre and post intervention phases respectively) in the observance of personal hygiene before handling or preparing food; a 22% increase in hand washing after using toilet from 21% to 43% for the pre and post intervention phases respectively); a 10% increase in the use of ITNs for malaria prevention from 32% to 42% for the pre and post intervention phases respectively; a 13% increase in knowledge gained on physical activity from 42% to 55% for the pre and post intervention phases respectively; a 2% increase in being physically active for at least 60 minutes for the past 5 days from 3% to 5% for the pre and post interventions phases respectively. Conclusion and recommendations: The health academy project has demonstrated to be a viable and cost-effective e-learning tool that can promote health and better learning in schools by enhancing health knowledge acquisition and influencing positive behaviour change among participants. As a health promotion tool, it has generated interest within and outside the school system thereby strengthening intersectoral and community action in support of health and education. Its replication/expansion in all the senior secondary schools and beyond is therefore highly recommended. The project has strengthened capacity of teachers – science and ICT teachers in particular – in the e-learning process and has created room for networking among them. Motivated by this and other aspects of the project, the teachers trained by the project have established the Gambia Communication and Information Technology Teachers’ Association (GAMCITTA). GMACITTA is now registered and has signed a memorandum of understanding with the Ministry of Basic and Secondary Education (MoBSE) to promote ICT and e-learning in schools. 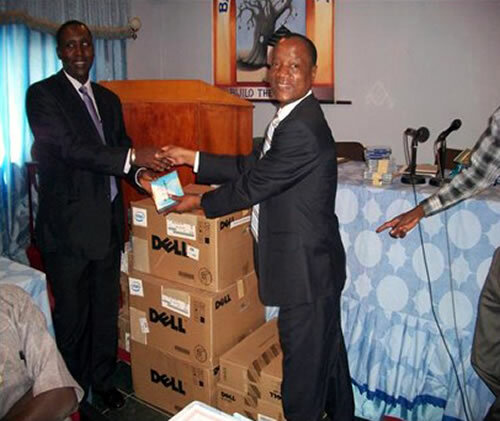 Hence, an infrastructure and platform has now been built to strengthen e-learning in Gambian schools. The health academy project has been able to mobilize a number of key sectors – health, education, safety and security; and youth and sports – to discuss common health issues. Some of the participating schools have also mobilized local communities in support of food safety in schools. The Safer Food for Better Health module was used to facilitate this process. Some schools have also planned to conduct “Move for Health” Days to promote physical activity in schools. The health academy project, which is becoming a household name in the Gambia, has been able to mobilize in support of public education on health academy project and other pertinent health issues. A programme (Health Academy Forum) has been established on the Gambia Radio and Television Services to sensitize the public on pertinent health issues. During the one-hour programme, experts from different sectors discuss local health issues as they relate to the health academy project.